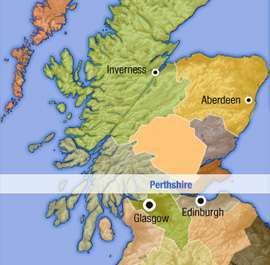 Pitlochry is Perthshire's gateway town for visitors to the Highlands. Situated just off the A9 to Inverness, Pitlochry has some of the cheapest guest house accommodation and hotels in Perthshire. Many tourists visit Pitlochry over the summer for the Highland shopping (House of Braur is only 5 minutes drive away) and superb cultural events at Pitlochry Festival Theatre. In September, the famous Pitlochry Highland games - and its Pipe bands - enchant locals and visitors alike! Popular choices of hotels in Pitlochry include Scotlands Hotel (Pitlochry's only spa and leisure hotel), The Fisher's Hotel, Rosemount Hotel and Pine Trees Hotel. Many golf, fishing and activities such as white water rafting, mountian biking and hiking surround Pitlochry and its nearby villages of Blair Atholl, Moulin and Killiecrankie.